Dubrovnik is an impressive walled city on the Adriatic Sea in the southern part of Croatia. Its impressive Old Town has made it one of the most popular tourist destinations in the Mediterranean. Most visitors prefer to stay in or near the Old Town, as this area has the most to offer with its unique atmosphere and character. There are several hostels near the Old Town, and several that are farther away. Consider your priorities as you plan your trip. It may be slightly more affordable with better amenities if you stay outside of the Old Town, but you will also miss much of what Dubrovnik has to offer. How much do hostels in Dubrovnik cost? Hostel Villa Angelina Old Town is located right within the Old Town walls. It's surrounded by the quaint atmosphere, interesting cafes, and delicious restaurants that you'll find in the area. Whether you're traveling alone or with a group of friends, this is the perfect place to meet other young travelers. It's location right in the heart of the city means that you can take advantage of everything that Dubrovnik has to offer. The hostel is also an affordable option given it's prime location. They offer the standard amenities including free wi-fi, luggage storage, and lockers. Every room has air conditioning and the hostel is well furnished. There's a shared kitchen which guests can use to prepare meals. There's also a nice roof top terrace that offers an excellent view over the city. The hostel has both private rooms and dorms available. The private rooms are twins, triples, or quads. The dorms sleep four, six or eight people. 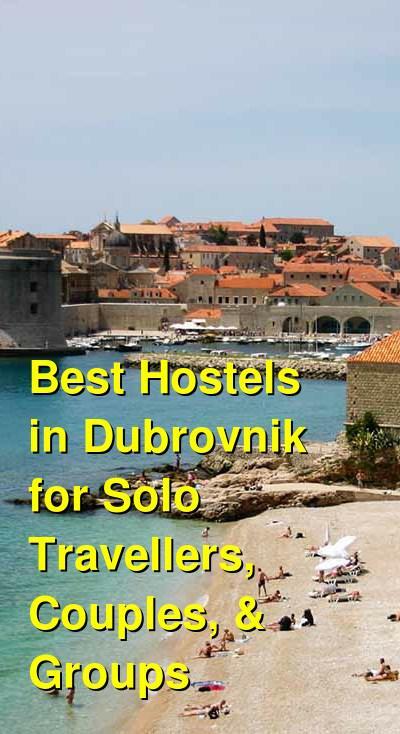 There are just a few hostels found in Dubrovnik's Old Town, and this is another one. It's also one of the most popular hostels in the area. It has a social atmosphere and you're sure to make a few friends while you're staying here. It also has the laid back feel of staying at someone's home. This is not a party hostel but instead a place where you can hang out with other guests, get to know the staff, and enjoy a pleasant setting in a beautiful city. The hostel is located at the center of the Old Town and is very close to the main street, but still set back enough to be away from the crowds. It's just steps from anything you might want to see or do. Most of the staff speak English and they can help you with any questions you might have. They're friendly and enjoy getting to know the guests that are staying here. There are also a variety of amenities available for guests including laundry facilities, airport pickup, boat and water scooter rental, kayaking, and tours of the area. The hostel has both private rooms and dorms available. Private rooms include twins, triples, quads, five, and six bed rooms. There is also a two bed apartment available. Dorms sleep four, five, six, and eight people. Four bed female only rooms are also available. Another one of the more popular hostels in Dubrovnik, City Walls Hostel was previously known as Fresh Sheets Hostel. It still has the same great reputation and is a fun and relaxing place to stay. The staff are friendly and helpful, the location is good, and the hostel has all of the amenities that you could need. A light breakfast is available in the morning. Guests also enjoy hanging out in the common room, which offers a little more space than the smaller guest rooms. The hostel has both private rooms and dorms available. There are double bed private rooms and four or six bed dorms. The hostel is kept clean and the furnishings are comfortable. The dorms are small enough to stay quiet and you can be assured a good nights sleep. Although this hostel might be a little more expensive then some of the other hostels in the area, it is well worth the money. Begovic Boarding House is located in Lapad, which is a beautiful part of Dubrovnik. The hostel has an impressive panoramic view the surrounding scenery. It's in a quiet area with a nice beach and a pleasant neighborhood. If you want a relaxing place to stay that is still close to a variety of activities then this is a good option. Nearby you'll also find a post office, bank, a shopping center, tennis courts, a market, and many good bars and restaurants. The hostel is about three kilometers away from Dubrovnik's famous Old Town and it takes about ten minutes to reach by bus. The staff are friendly at the hostel and can help with any questions you may have. They can also help you organize any tours or activities that you might be interested in. There are several daily excursions available including tours to the Elaphiti Islands, Mostar, Hawk Fortress, and Montenegro. The hostel has private rooms and dorms available. Private rooms are twins, doubles, triples, or quads. Each has a private bathroom attached. Dorms sleep up to four people.